Ice accumulation is a serious safety hazard for aircraft. 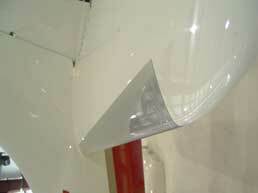 The presence of ice on airplane surfaces prevents the even flow of air, which increases drag and reduces lift. Ice on wings is especially dangerous during takeoff, when a sheet of ice the thickness of a compact disc can reduce lift by 25 percent or more. Ice accumulated on the tail of an aircraft (a spot often out of the pilot’s sight) can throw off a plane’s balance and force the craft to pitch downward, a phenomenon known as a tail stall. The Icing Branch at NASA’s Glenn Research Center works using the Center’s Icing Research Tunnel and Icing Research Aircraft, a DeHavilland Twin Otter twin-engine turboprop aircraft, to research methods for evaluating and simulating the growth of ice on aircraft, the effects that ice may have on aircraft in flight, and the development and effectiveness of various ice protection and detection systems. With NASA assistance, Kelly Aerospace has developed lightweight heating elements capable of keeping ice from forming on airplane wings. Typically, ice is removed from general aviation craft with either “weeping wing” liquid deicing systems or inflatable rubber bladders, called pneumatic boots, installed along the wings. Both of these methods have drawbacks, including the finite, limited effectiveness of the liquid deicers and the added weight and power usage of the boots. Collaborative research at Glenn focused on using expanded graphite foil heating element technology to effectively replace these standard methods with a method that was usually limited to use on jets with heated wings and leading edge surfaces. The super-thin graphite, which covers a large surface area without significant weight penalties and heats quickly to melt ice, proved a viable solution, and this new safety equipment has now been made available to the aerospace community. Kelly Aerospace Thermal Systems LLC, of Willoughby, Ohio, is a division of Montgomery, Alabama-based Kelly Aerospace Inc., a leading subsystem supplier to general aviation equipment manufacturers and aftermarket customers. The Ohio-based design and development branch worked with researchers at Glenn on the deicing technology with assistance from the Small Business Innovation Research (SBIR) program. Kelly Aerospace acquired Northcoast Technologies Ltd., a Cleveland-based firm that had similarly done graphite foil heating element work with NASA under an SBIR contract. Through its research, Northcoast had developed the Thermawing system, a lightweight, easy-to-install, reliable wing and tail deicing system. Kelly Aerospace engineers combined their experiences with those of the Northcoast engineers, and now continue to advance this work. The NASA-funded research has resulted in a handful of new products and applications, including the certification and integration of a thermoelectric deicing system, DC-powered air conditioning for single-engine aircraft, and high-output alternators to run them both. Marketed as Thermawing, the aircraft deicing system employs a flexible, electrically conductive graphite foil that heats quickly for instantaneous rises in temperature when needed. It has an ultra-thin laminate construction that allows for low weight penalties. With this system, users are able to retrofit an aircraft with between 100- and 150-amp alternators producing 50 to 80 volts with negligible weight addition. This reliable anti-icing and deicing system allows pilots to safely fly through ice encounters and provides pilots of single-engine aircraft the heated wing technology usually reserved for larger, jet-powered craft. It is simple to apply and requires far less wattage than standard electrical metal heating systems. The thin laminate system is applied like a tape, and it will bond to any surface of an aircraft where icing might become a problem. The laminate contains the flexible, expanded graphite foil that serves as an electrical and heat conducting layer, that works as effectively as multiple heat conducting layers and layers of electrical insulation. Energy can be controlled across the system, so that certain zones can be heated according to need, an energy-saving measure. The Thermawing system is currently certified for use as airfoil protection on Columbia 350 and 400 single-engine aircraft, as well as the Beechcraft Baron B55. Kelly Aerospace is continuing to develop systems for other aircraft. 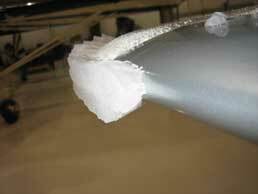 Ice forming on an aircraft can pose serious risks. The Icing Branch at Glenn Research Center seeks to minimize these hazards by creating technologies that detect and prevent icing. The company has also developed Thermacool, an innovative electric air conditioning system also for use on single-engine, general aviation aircraft. The typical method for cooling these aircraft uses a standard automobile air conditioner compressor, typically running off of a combination of belts hooked to the engine and electric motors, which drew too much energy for their use to be practical while on the ground or idling. Air conditioning in the cabin was available, then, only when the aircraft was airborne. Kelly Aerospace addressed this with a new compressor, whose rotary pump design runs off an energy-efficient, brushless DC motor. This now allows pilots to begin cooling the plane before the engine even starts. Weighing less than 14 pounds, the total system draws only 50 amps. The small compressor can be attached just about anywhere within the aircraft, and it is virtually maintenance free. Kelly Aerospace has been granted Supplemental Type Certificates (STCs) from the Federal Aviation Administration for use of the revolutionary air compressor on Cessna 182 models P, Q, and R, and Cessna 172 models R and S single-engine aircraft. It is currently developing a customized kit for the Piper PA-32 Cherokee Six, and more STCs are in the works. To assist in running both the Thermawing deicing system and the Thermacool air conditioning system, Kelly Aerospace has designed an alternator capable of creating ample electricity, as well as the other complex electronics on the craft, whether the plane is airborne or idling on the ground. Recently, Kelly Aerospace Thermal Systems entered into an agreement with Redmond, Oregon-based RDD Enterprises LLC, a developer of safety and performance systems for the experimental aircraft market. The partnership will allow Kelly Aerospace’s thermal deicing systems to be widely available in this market. Thermawing™ and Thermacool™ are trademarks of Kelly Aerospace Inc.